Boneset, which has the scientific name Eupatorium perfoliatum, is a member of the Compositae family. Perfoliatum can refer to the way that the stem appears to perforate the base of adjoining leaves. Boneset thrives in swampy areas, low-lying damp grounds, wet woods, and along streams in eastern North America, from Nova Scotia and Quebec in Canada to Florida and west to Minnesota and Louisiana in the United States. It also grows in abundance from the Gulf states north to Nebraska, New Brunswick, and Manitoba. Boneset is a perennial plant that grows to three to five feet high, with a rough, hairy stem that can reach a height of one to five feet from a horizontal, crooked rootstock. It has white or pale purple flowers that blossom from July to September. Boneset was introduced by the Native Americans to English settlers way back then, and was used extensively to treat a particularly harsh strain of flu called break bone fever, which was a fancy way of calling dengue fever, which induced extreme muscle pain among sufferers, who felt like their bones were breaking. Boneset was also used by American Indians to counter the symptoms of malaria and typhoid fever, an acute illness that is caused by the Salmonella enterica serotype Typhi bacteria that is characterized by loss of appetite and severe headaches and stomach pains. 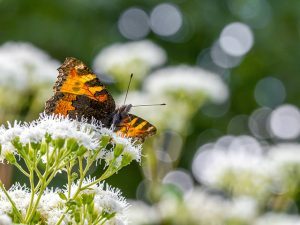 Butterflies, which get attracted to flowers or plants that have vibrant colors, tend to leave bonesets alone – one less pollinator for the herb. However, many beetles, wasps, bees, and flies prefer these dull plants to their more entertainingly-colored counterparts. Boneset has analgesic, antibacterial, febrifuge, and immune stimulant properties. Boneset has diaphoretic properties. It induces sweating. Boneset has emetic properties. It can induce vomiting, which is good for easing symptoms of fever and flu. Boneset has anti-inflammatory properties. It can be used to treat the symptoms of rheumatism and fibromyalgia. It also prevents blood vessels from rupturing. Boneset has diuretic properties. It can stimulate urine production, thereby ensuring the regular removal of toxins form the body. Boneset has cancer-fighting abilities. Its flavonoid content is helpful in stopping the growth and proliferation of cancer-cauisng tumors and cells. Boneset is good for the immune system. It improves on slow body recovery and poor immune response. It is a great treatment for alleviating coughs, common cold, and upper respiratory congestion and infections. Boneset is good for the digestive system. It has laxative effects that make the passage of bowel from the body easier. It can also treat diarrhea and constipation and purge the colon of intestinal worms. It even increases appetite. Boneset is good for the skeletal system. It provides for the health of the bones, the joints, and the nerves. Boneset can be taken as capsules, teas, and tinctures. Be careful not to overconsume it, however, for it can cause diarrhea, nausea, and vomiting in excessive amounts. People who are allergic to feverfew, chamomile, or ragwort, or those who are suffering from some form of liver ailment, should not use it. Boneset is good for the immune, digestive, and skeletal systems. Boneset has analgesic, antibacterial, febrifuge, and immune stimulant, diaphoretic, emetic, anti-inflammatory, and diuretic properties.